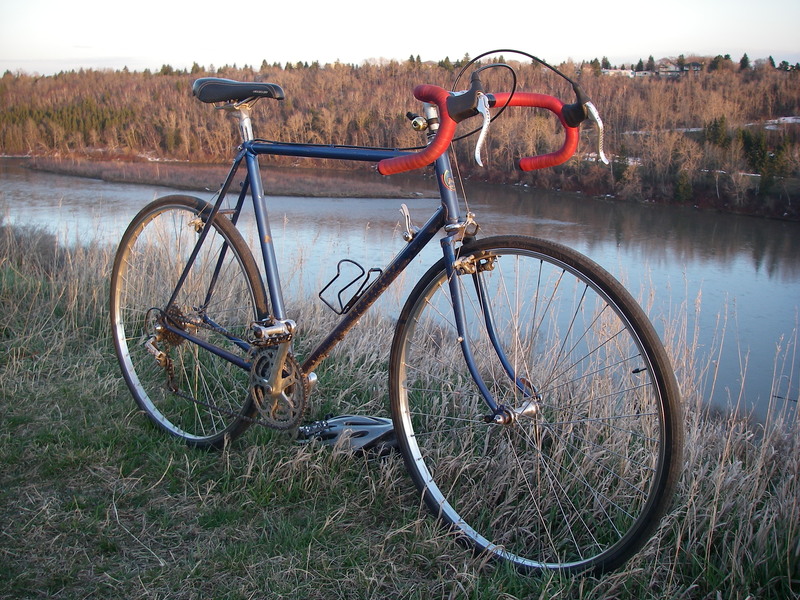 I am in the process of slowing restoring my 1983 Nishiki Continental touring bike for active touring duty. 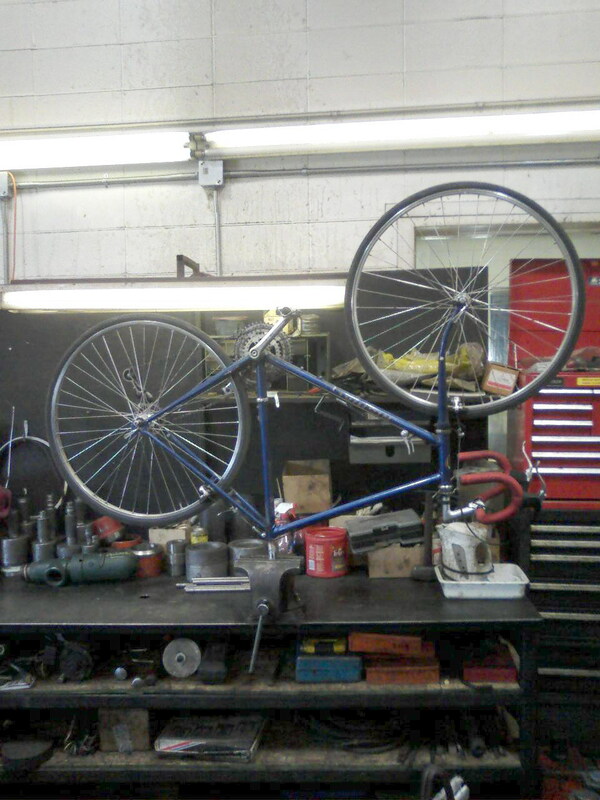 I say restoring, but really this bike is in very fine shape and it needs little work. When I bought it it was with the intention of using it for light touring. Then I found out just how light, smooth and fast it is to ride just as it is. I began to question whether I should start encumbering it with all the touring accessories.But, in the end I am a practical, utilitarian sort of cyclist. This bike was built to tour and tour it shall. 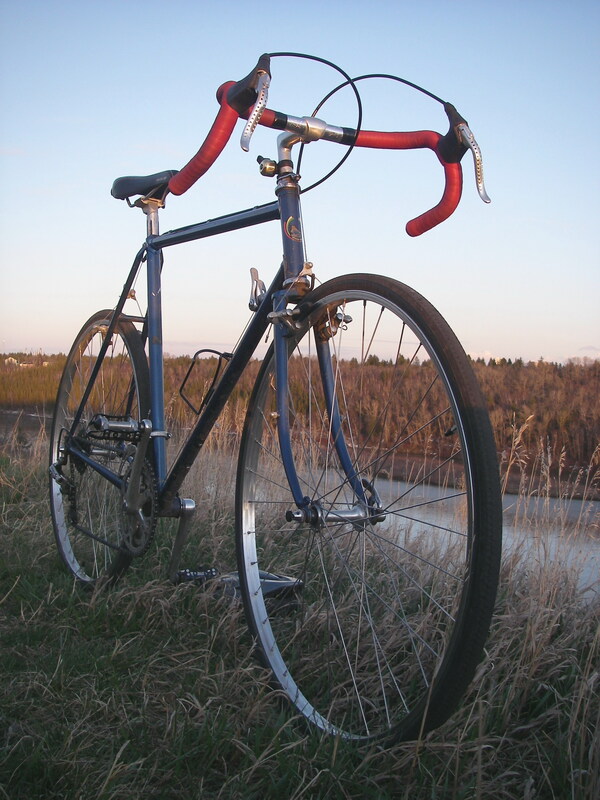 Besides, this gives me an excuse to shop for another vintage road bike to use as a speed machine. This was supposed to be a quick first check to see how stuck the seatpost was. The fellow I bought the bike from warned me that the seatpost was stuck. He had brought it to a local bike shop and they were unable to remove it. “That’s OK”, I thought, “It’s set at about the right level so I wont worry about it.” However, as I rode the bike over the next month it became obvious that the seatpost was actually a little bit too low. It wasn’t enough to be a big concern over the course of my 11km commute but I could definitely feel a slight extra strain on my knees. This wasn’t going to be good if I tried to ride it for 8 hours a day. 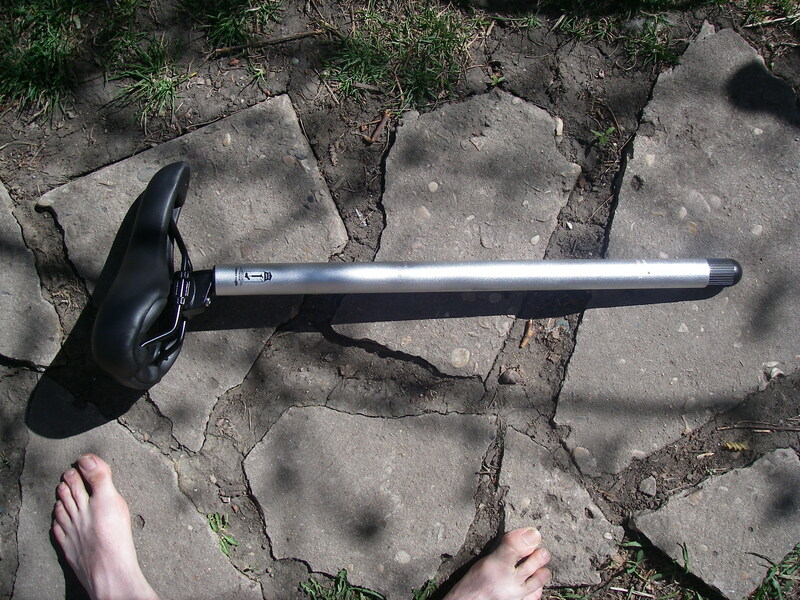 Researching stuck seatposts on the internet I discovered that I might be in for a bit of a struggle. 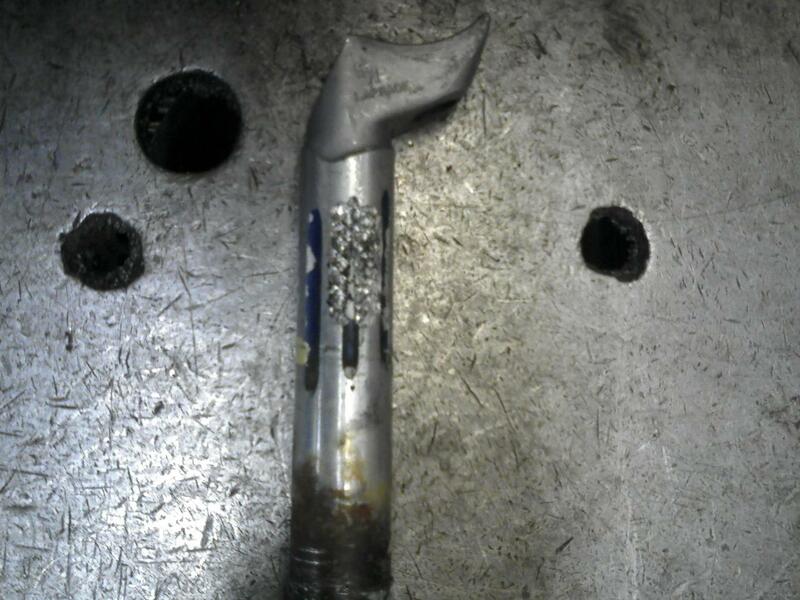 Some are easy to remove, I learned, and others….not so easy. Given that the bike shop mechanic had failed, I figured this would be a tough one. 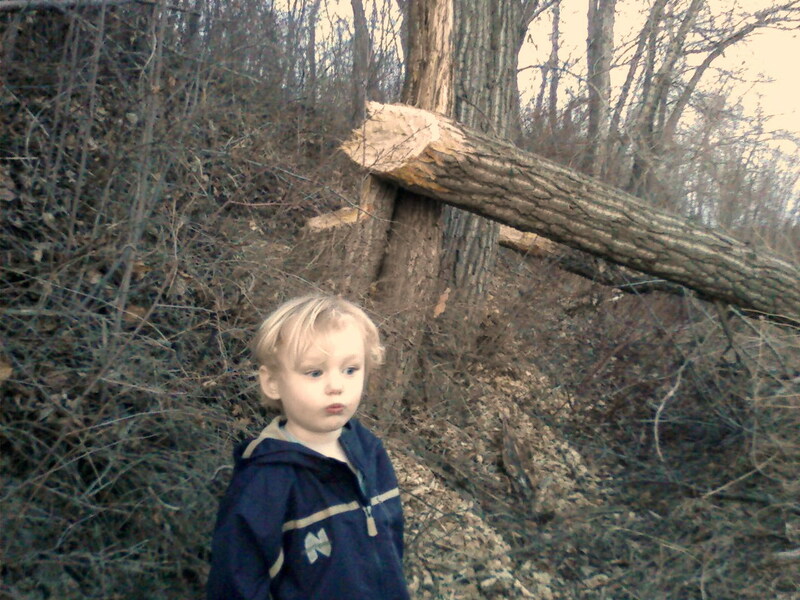 Most likely I’d have to cut it out and buy a new post. 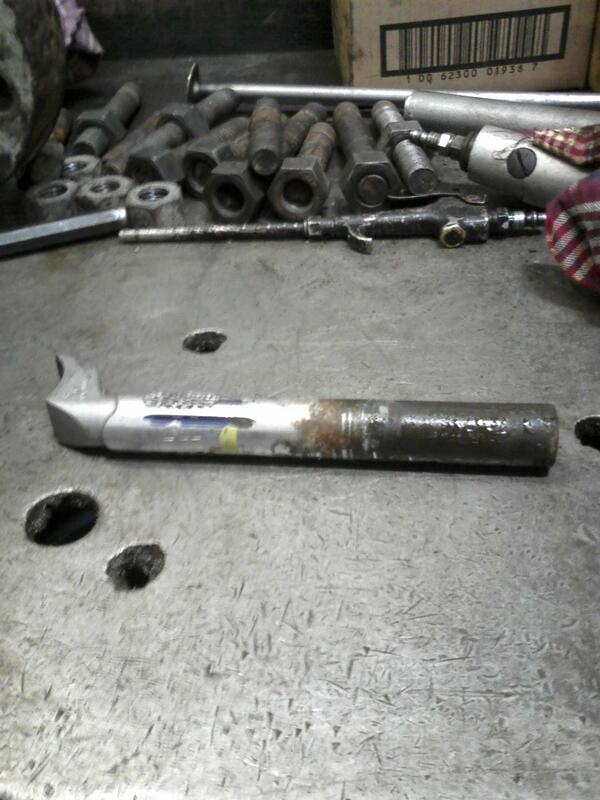 I brought the bike to work where I have a greater assortment of tools. 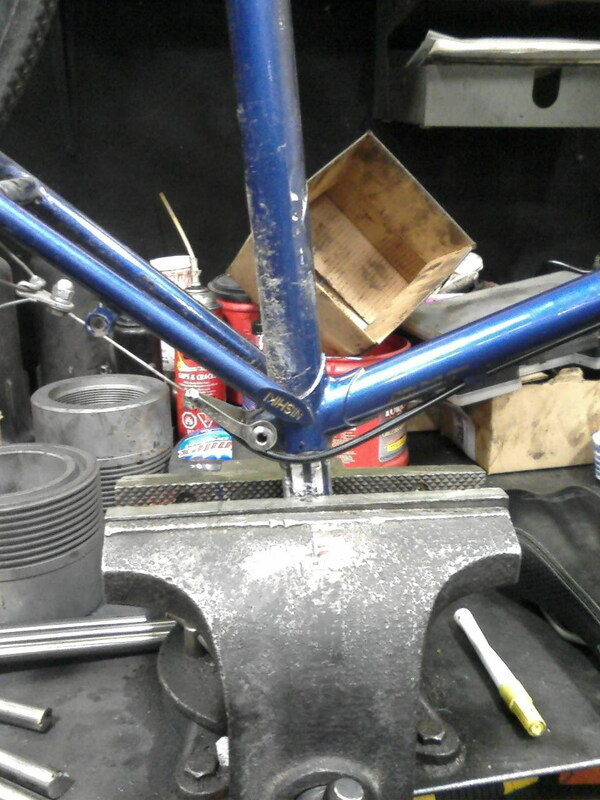 My first step was to clamp it in the vise and use the bike frame as a lever to torque the post out. I was careful to not apply too much force as I have heard that it is possible to bend the frame doing this. 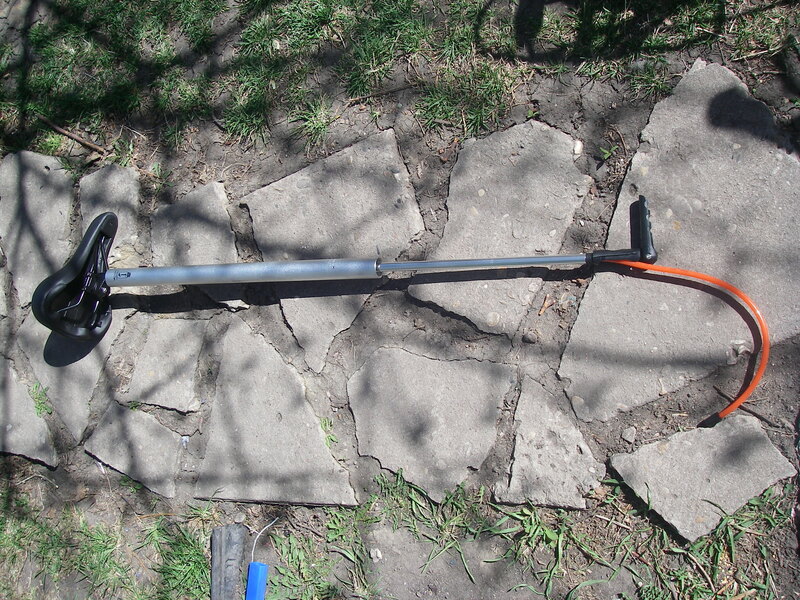 To my surprise, after only a moderate amount of twisting the seatpost broke free and turned! Take that LBS mechanic! My initial elation was a little dampened when I realized that it still wasn’t going slip out easily. Nevertheless, after less than half an hour of straining and twisting (and wondering how long the damned post actually was) it came out. The post was chewed up by the vise but was structurally undamaged (EDIT: It only now occurred to me that I should have clamped the post near the top where any damage would be hidden by the seat) . A quick trip to the sandblaster and a little buffing afterwards and it was looking a little more presentable. I figure I’ll ride with it like this for a while and maybe replace it at a later date. Next project: mounting some metal fenders. Cleaned up it doesn't look so bad. At least I can shop for a replacement at my leisure. 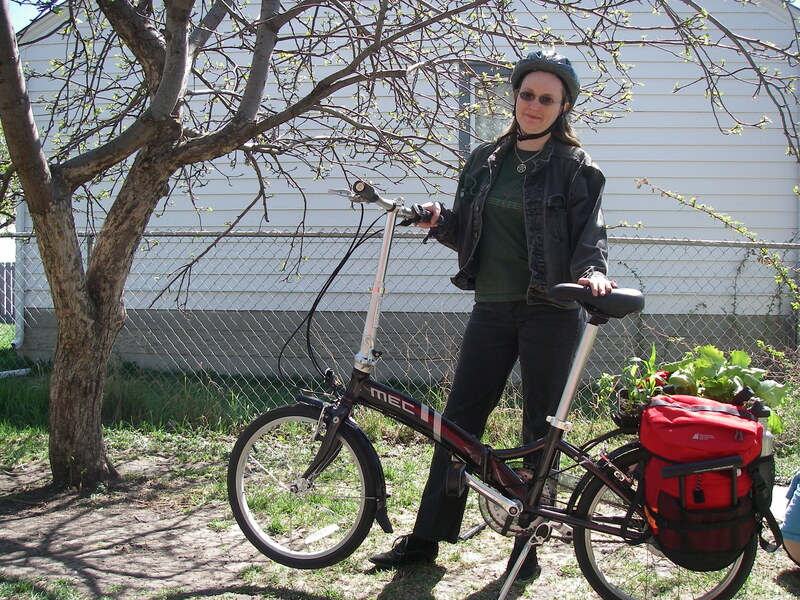 The household bike fleet has had a new arrival, a shiny new Dahon folding bike from Mountain Equipment Co-op, the Origami. This bike replaces my wife’s old bike, an 80’s vintage Dahon V. The old bike had made her a fan of small wheeled bikes, liking their small size and nimble handling. The old Dahon however was a rickety specimen and not a particularly good bike overall. We had considered some of the higher end folding bikes but considered that this one would best suit her needs and our budget. 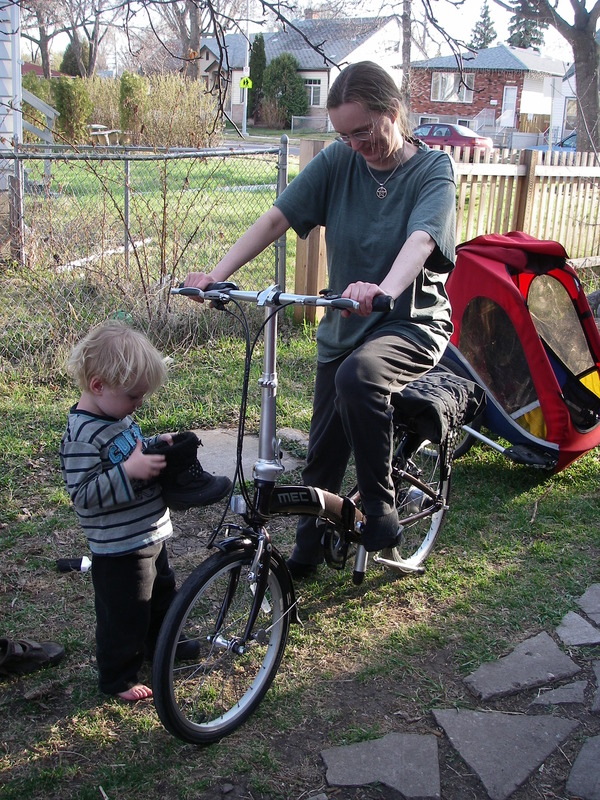 On Mother’s day she gave one a test spin and was quite taken with it. The two they had in the shop were on hold but they had two more in stock not assembled. We paid for one and the MEC bike shop had it ready by Tuesday. This is a momentous occasion. It is the first time I have ever purchased a bike new from a shop as I am more of a used bike kind of guy. It was nice that the bike came with some instructional documents and a two tubes of paint for touching up scratches. Centre hinge allows lightweight aluminum frame to fold back on itself. 20 x 1.5in. tires provide plenty of cushioning. ProMax V-brakes are powerful and easy to maintain. 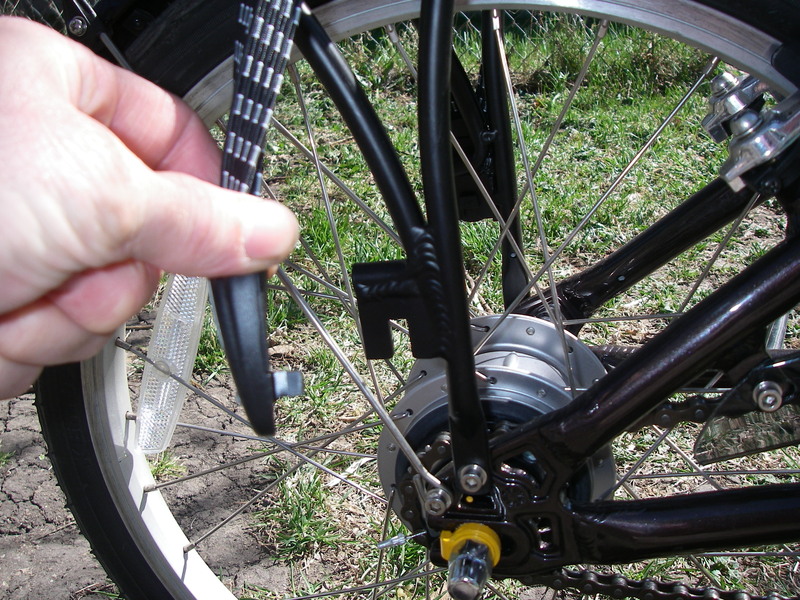 Nexus 8-speed internal hub allows rider to change gears whether pedalling or not. 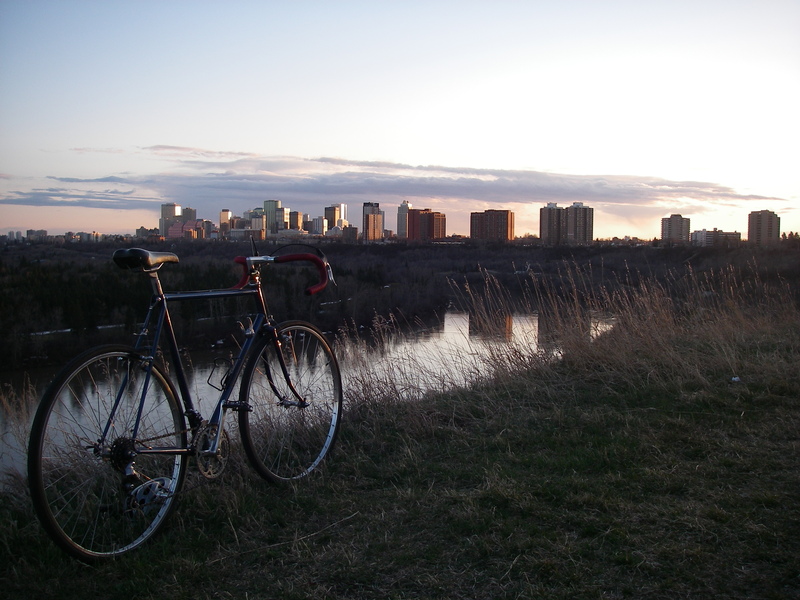 Gear range suits most city riding. Folded size is approximately 34 x 67 x 64cm (13.3 x 26.1 x 25in.). Adjusts to fit riders from 125 to 188cm (4ft. 10in. to 6ft. 2in.). Designed to support a maximum weight of 105kg (230lb.). Seatpost telescopes into the frame. Handlebars telescope and fold flat. 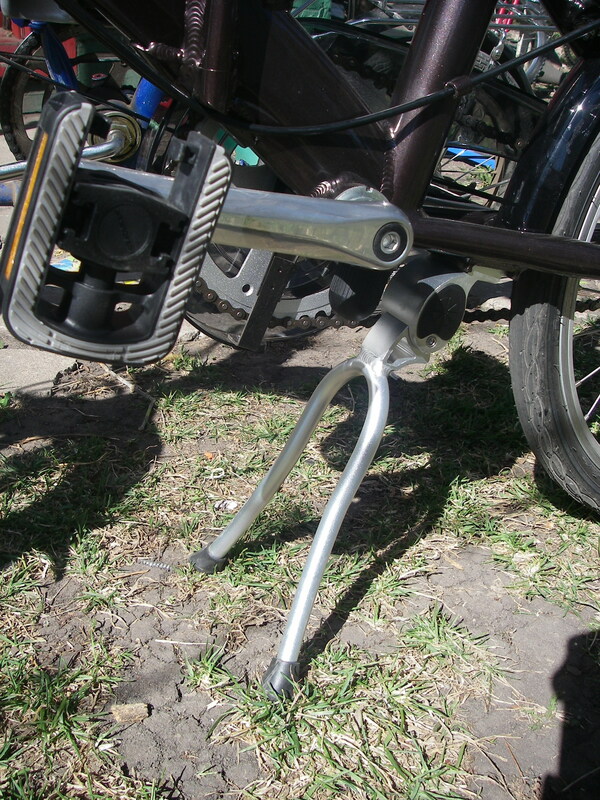 SunTour pedals fold against crank when not in use. 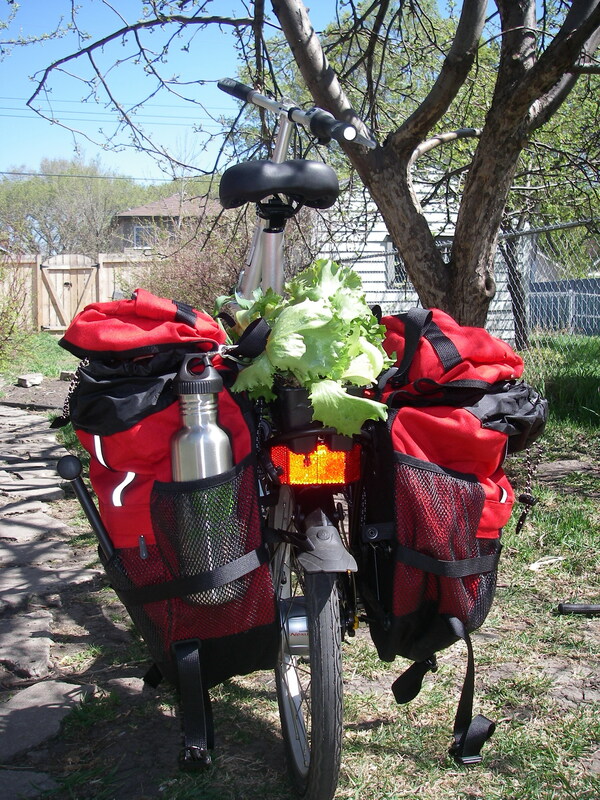 Comes with a canvas carrying case, fenders, and a rear rack. 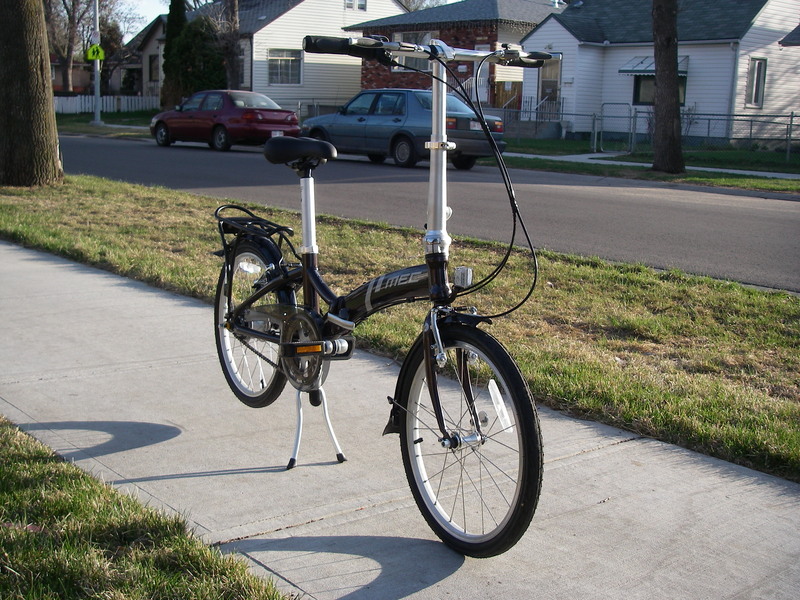 Manufactured by Dahon to MEC specifications. 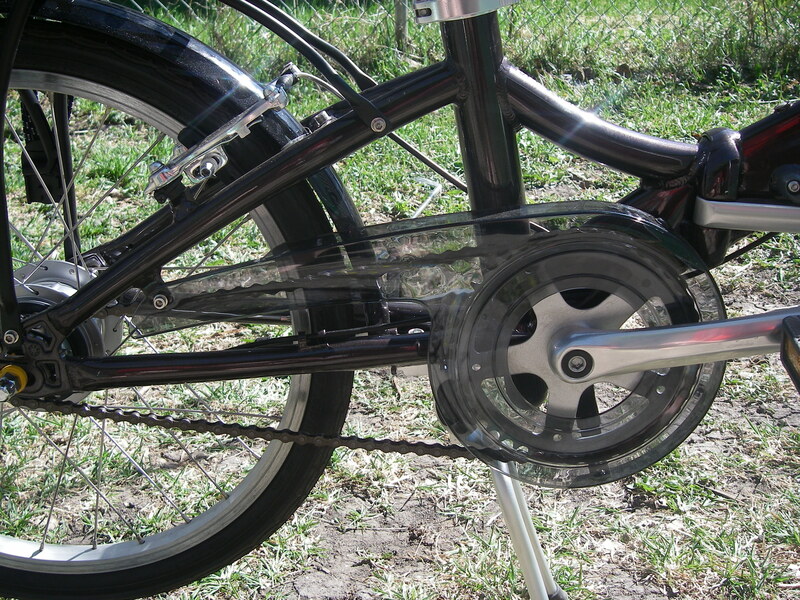 Dahon Roulez 20 x 1.5in. 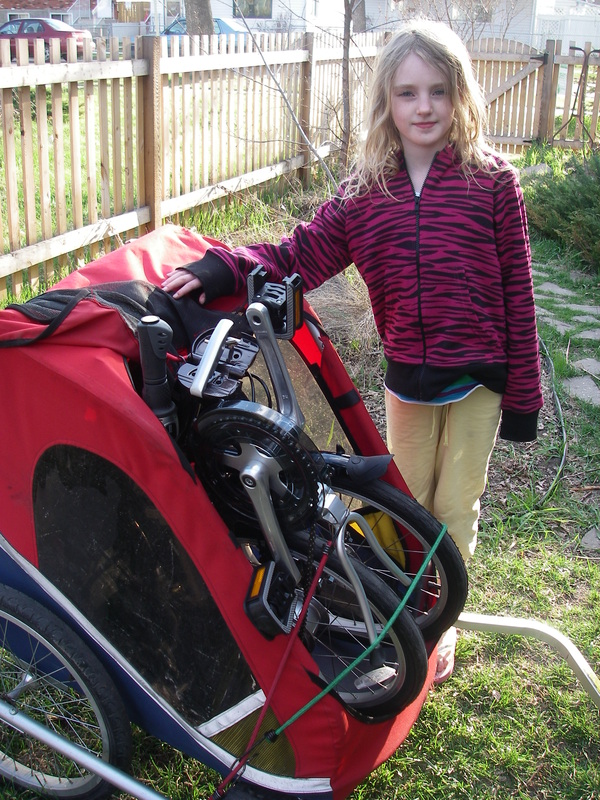 I took the bike home using my Chariot child trailer. 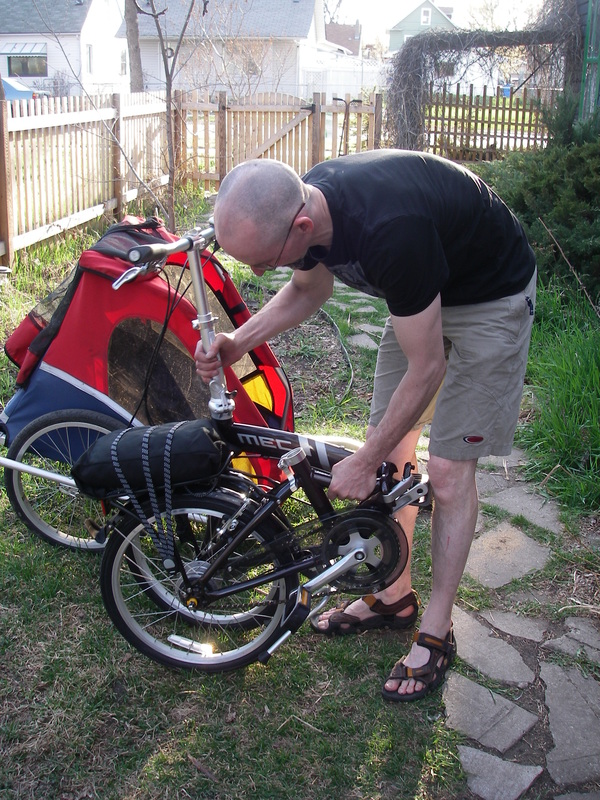 Folding the bike was easy enough to do without consulting any sort of instructions. It doesn’t fold particularly small or quickly but this is not a feature we will be using often. If they were easier to find we might have purchased a small wheeled bike that doesn’t fold at all. 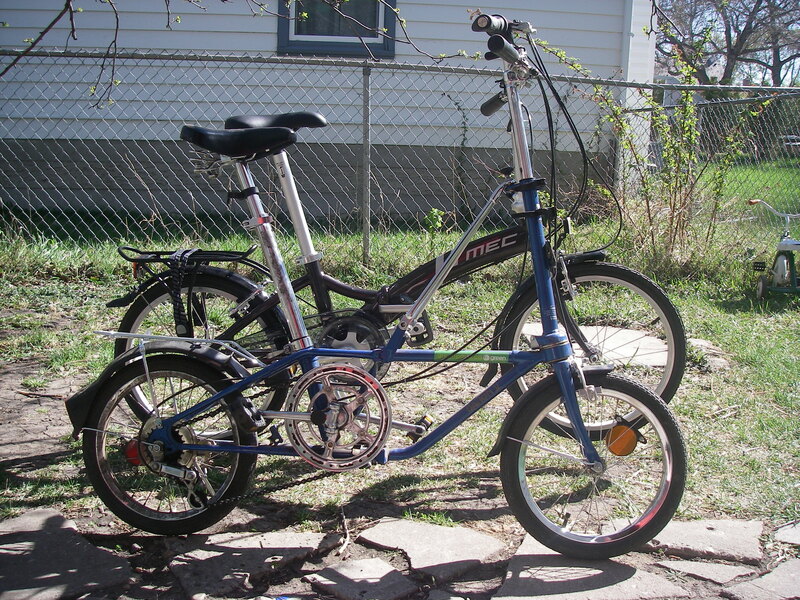 Still, it is definitely an improvement over the old Dahon which was a beast to fold. The center hinge does seem stiff to me but is quite solid. can report that this is quite a nice little bike. It is very solid with no flexing or creaking, has a nice tight turning radius and is overall very zippy (technical term). It is SO much more rigid than the old Dahon. I quite like the internally geared hub. It is shifts to lower gears very smoothly, almost unnoticeably. The shifting to higher gears is more obvious but still smooth. Being able to change gears while stopped is certainly a commuting advantage . I haven’t taken the time to figure out the gear inches or to test it on hills but so far the gear range seems spot on for urban use. It has a number of other nifty features that I’ll detail in the photos below. Home from the Famer’s Market with a load of groceries. This week-end my wife borrowed a set of my panniers and went on a shopping trip to the Farmer’s Market downtown. The rack is quite small and my feet had heel strike problems with the 40L panniers when I was testing them out on the bike . My wife, on the other hand, has much smaller feet (size 5 1/2 AA) and had no such problem. The origami proved quite able on this utility trip and she hauled home lots of groceries and some bedding plants. 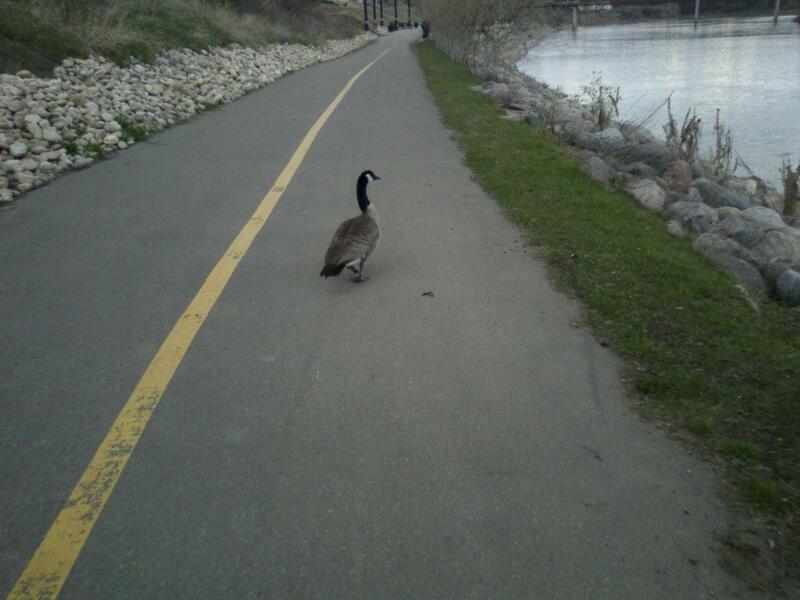 It is worth noting that we have been having uncharacteristically windy weather here in Edmonton and she was able to power through the headwind. Time will tell how this bike holds up an performs but so far, so good. My wife says it makes her feel more like a real cyclist though she does miss the smaller 16 inch wheels of the old bike. I’m looking forward to trying out more myself and I’ll be sure to post any new observations here. UPDATE: I have discovered that to incorporate the built-in pump the seatpost is a larger diameter than is normal. 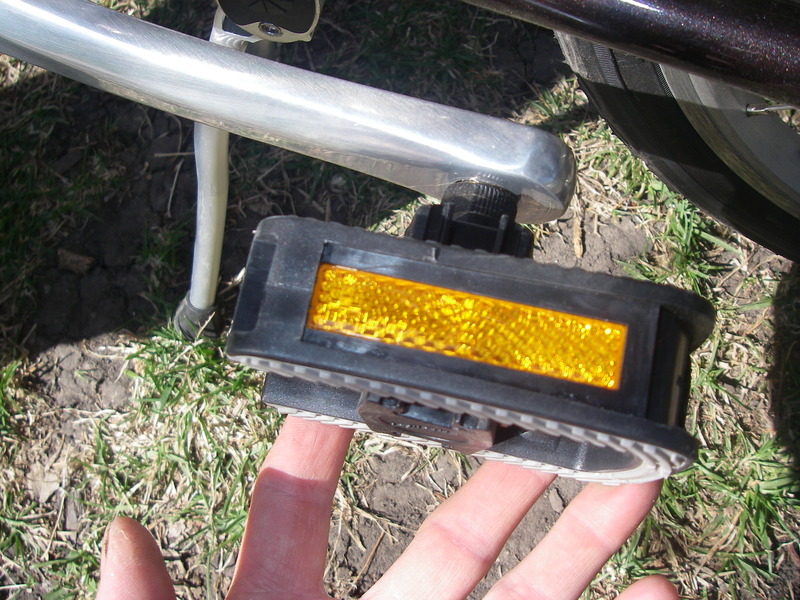 This made it harder to fit a rear light to the post using the light’s provided mounting clip. In the end I had to find a longer bolt. UPDATE (May 2013): MEC has put this model of bike on clearance for $550.00 which is an absolute steal. If you have been considering it I recommend snapping it up while supplies last. 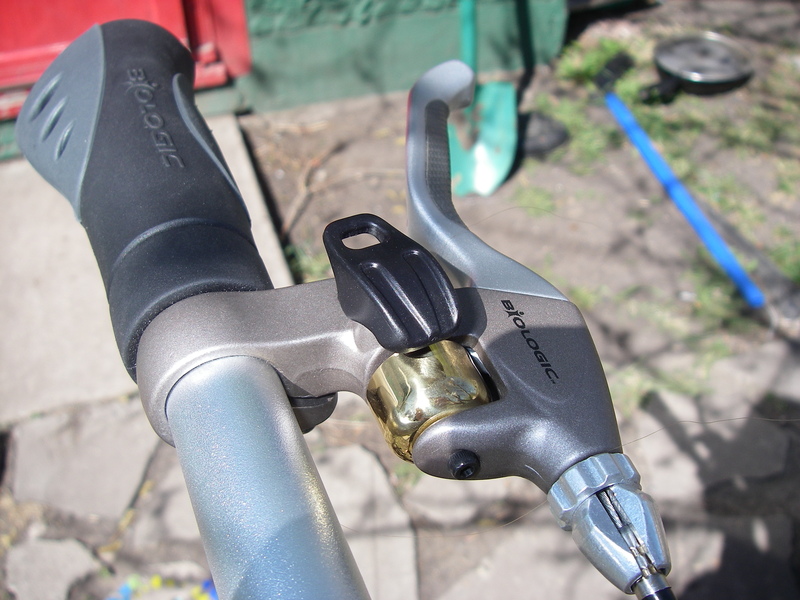 The brake lever has a nifty little integrated brass bell. 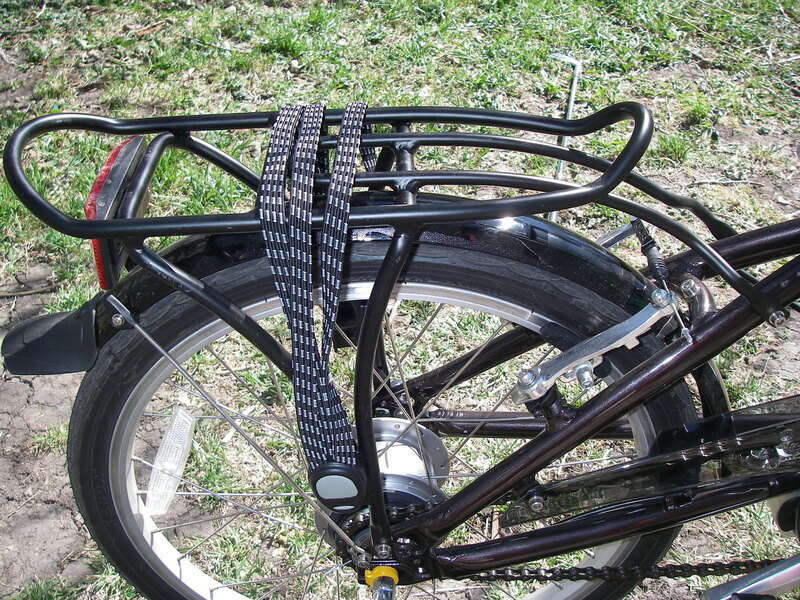 Fenders and rear rack with cargo bungee. The cargo bungee hooks into this little slot on the rack. 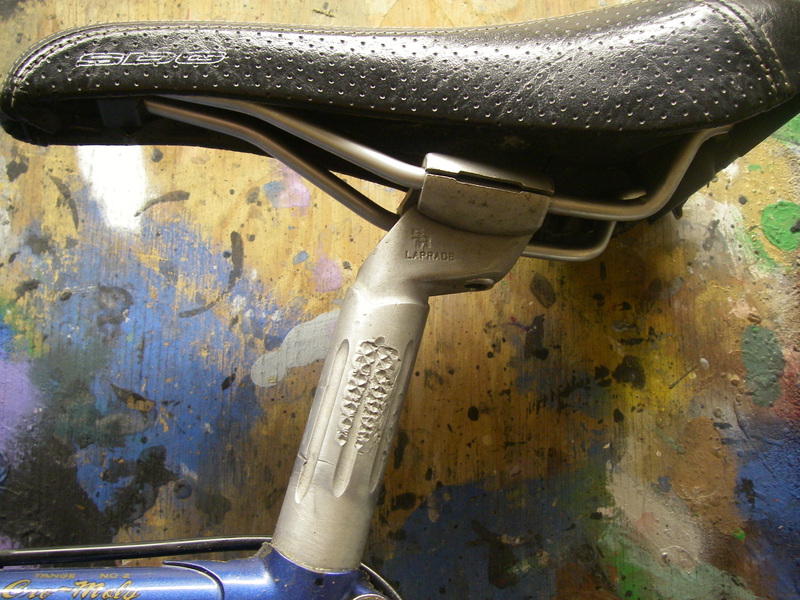 The seatpost contains a built in pump. Here’s the pump. The flexible hose is nice but it doesn’t have a quick release. I haven’t used a screw-on pump since I was a kid. Or maybe there is a part missing. I do love a double legged kickstand. 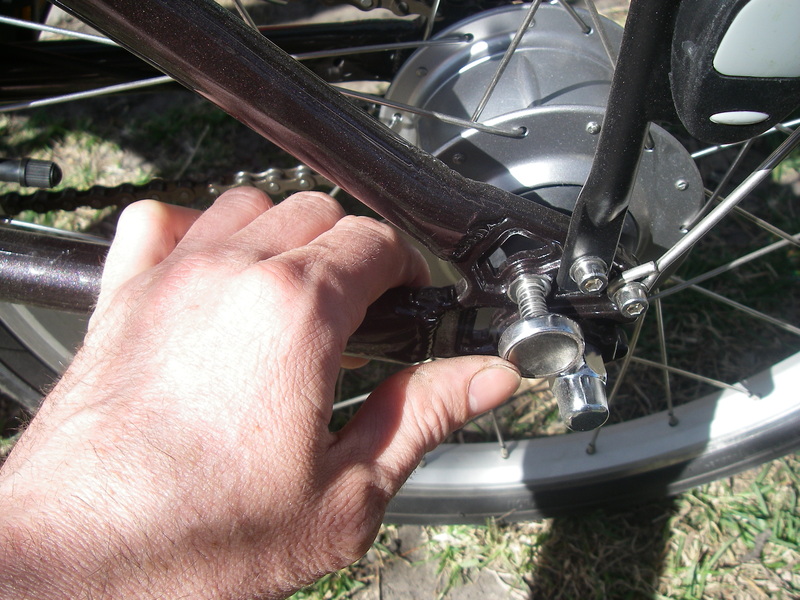 A litte magnet doohickey for holding the frame together in the folded state. Daughter learns to ride bike! I am something of a fraud as a cycling father. 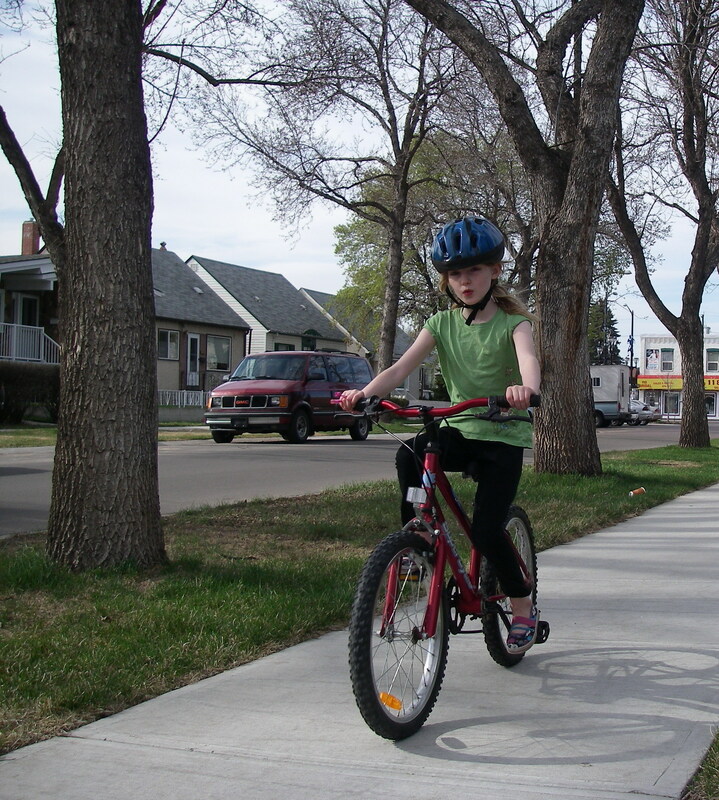 My daughter is nine years old and hadn’t learned to ride a bike yet. This Spring I was determined to teach her and unlike previous years everything clicked for her. She spent only a couple of days scooting without pedals before I felt she was ready. I put the pedals back on and away she went! After a few minutes of cruising up and down the sidewalk she said “Dad, when I get good at this I’m going to be a bike geek like you and ride all year round.” Ahhhh, that makes a bike geek Dad happy indeed. It’d been more than a month since I got out for a bit of busking. Last night I joined my busking partner in crime to play the incoming crowd for the Rammstein concert at Rexall Place. I brought my busking weapons of choice: the Lark Cittern and the Republic Resonator Mandolin. The crowd surprised us by being fairly large early in the busk and continued steady for the hour and half we played. As usual, I started off playing tunes. As is not usual, I ended playing lead for the entire busk. After more than a month of not playing at length that turned out to be bit of a workout for the poor fingers. Also, given the nature of the crowd I felt compelled to play almost exclusively high energy tunes at top speed. I liked this incoming crowd. Good natured and appreciative. You might think that a crowd bound for Rammstein would be indifferent to a couple of scruffy buskers playing Celtic music. Not so. I have noticed before that metal fans appreciate the finger numbing calisthenics that are necessary to play tunes at high speed. Not so different from a lead guitar break. One guy stopped to listen for a while and asked if he could try out my instrument. It was a quiet break between trains so I said sure. He played pretty well considering he wasn’t familiar with the tuning. Those metal guitar players sure know how to use their one-string scales to good effect. A good one third of the crowd was dressed spectacularly for the show. I enjoyed that. So much leather, metal, fur, fishnet and makeup! The former heavy metal nerd in me appreciates the effort and expense those outfits represent. Plus, its just plain fun. It’s much more entertaining to busk a crowd like that. I didn’t play the outgoing crowd for reasons of fatigue and family duty but I’m sure it was a lively one. And after last night, I’m keen to start the football busking season. I needed a new header image for my blog as the winter picture was feeling unseasonal. Since I hadn’t yet taken any pictures of my favourite bicycle Nishiki-san I took a quick spin (the first of the year on this bike!) 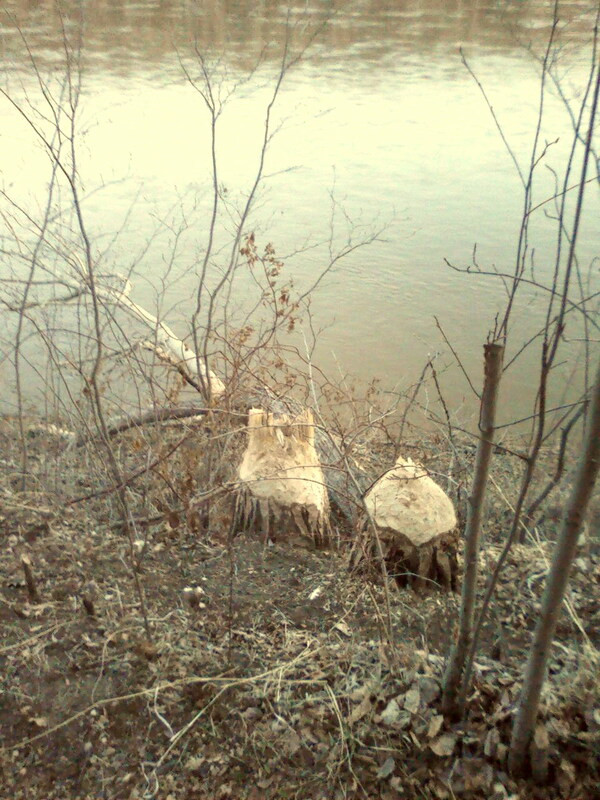 over to the top of the river valley and accomplished both tasks at once. I finished just as the sun was setting. 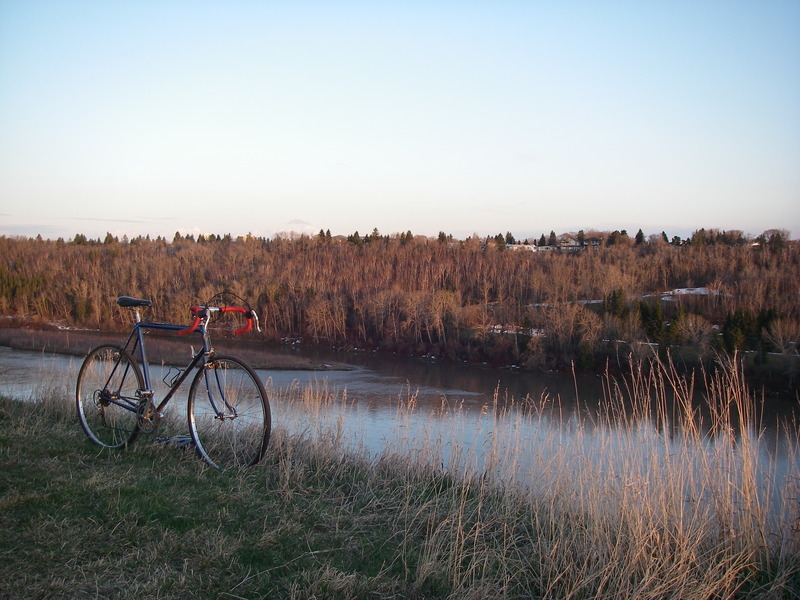 Here are a few shots of a pretty river valley and a pretty bike.